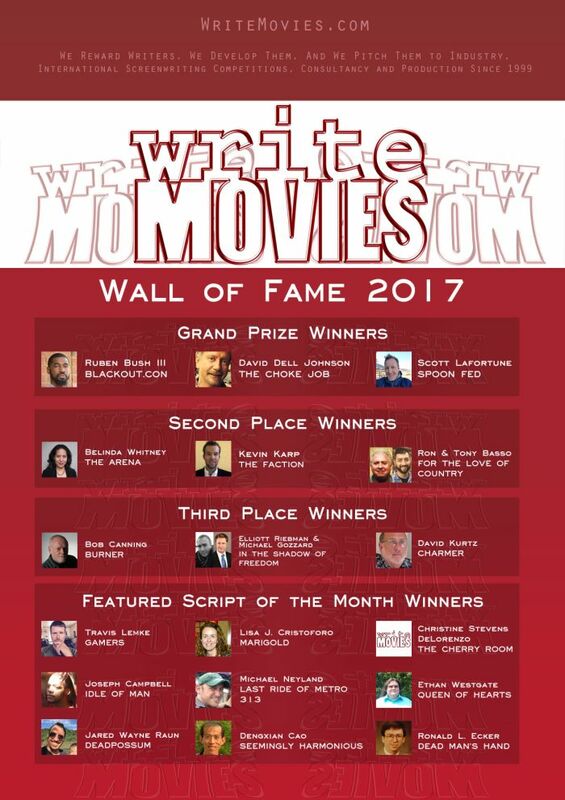 You could be in our next Wall of Fame and benefiting from all of the script development, prizes and pitching to industry we offer – follow in the footsteps of our winners from 2017 and check out our latest contests and offers! Grand Prize Winners: BLACKOUT.CON by Ruben Bush III, CHOKE JOB by David Dell Johnson, and SPOON FED by Scott LaFortune. Second Placed Winners: THE ARENA by Belinda Whitney, THE FACTION by Kevin Karp, and FOR THE LOVE OF COUNTRY by Ron and Tony Basso. Third Placed Winners: IN THE SHADOW OF FREEDOM by Elliott Riebman and Michael Gozzard, BURNER aka CELL-2-CELL by Bob Canning, and CHARMER by David Kurtz. Featured Script of the Month Winners: GAMERS by Travis Lemke, MARIGOLD by Lisa J. Cristoforo, THE CHERRY ROOM by Christine Stevens DeLorenzo, IDLE OF MAN by Joseph Campbell, LAST RIDE OF METRO 313 by Michael Neyland, QUEEN OF HEARTS by Ethan Westgate, SEEMINGLY HARMONIOUS by Dengxian, DEAD POSSUM by Jared Wayne Raun, and DEAD MAN’S HAND by Ronald L. Ecker.